In considering what an “American” meatball recipe might be, my mind immediately turned to Ashkenazi Jewish homestyle sweet and sour meatballs (although I did also consider making these). Every Jewish mother has a recipe for their own special riff on sweet and sour meatballs, and they usually have the craziest sounding ingredients like grape jelly and ginger snap cookies. My mother-in-law generously shared her recipe with me, which calls for tomato sauce, cranberry sauce, and shredded cabbage. Before you judge, please believe me when I say that these might just be the single most delicious things I have ever eaten. A jar of tomato sauce is heated with a can of cranberry sauce until combined. Add your meatballs, top with shredded cabbage, cover, and cook for at least an hour and a half. Don’t uncover them for one second, just shake the pot every once in a while. The result is the single most tender, flavorful meatball you will ever eat. Ever. And you know how I feel about meatballs. Serve with rice for a meal, or make them small and serve with toothpicks as an unbeatable appetizer. I made this for my husband and one friend and we polished off the whole thing. All of it. We were practically licking our plates. These are that good. The Shiksa blog gave me a great idea on how to make sweet and sour meatballs Kosher for Passover, if anyone is interested: use matzo meal in place of breadcrumbs! Genius. Oh, and for those of you in Israel, East-West in the Carmel Market now stocks cranberry sauce! Don't be frightened by the ingredients. These are the single best meatballs you will ever eat. Ever. The whole family will love them and they make a great appetizer or entree. In a large dutch oven or pot combine the tomato and cranberry sauces and simmer until fully combined. Combine the meat, eggs, garlic, onion, and breadcrumbs. Form into small balls and place in the pot with the tomato-cranberry sauce as you go. 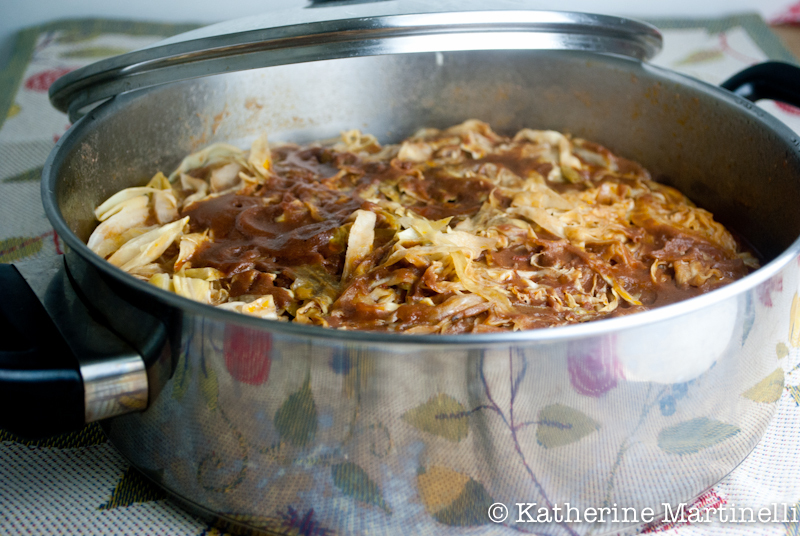 Cover with the shredded cabbage. Cover the pot and simmer for 90 minutes, shaking occasionally (do not uncover). Serve with toothpicks as an appetizer or with rice as a meal. Kosher meat Make kosher for Passover by using matzo meal in place of breadcrumbs. You have written such a crisp prelude, summarizing everything to the point. Your version sounds interesting and I have bookmarked your recipe. I will make mine with lamb. I love your easy version. When the list of ingredients is wacky, the result is almost always incredibly delicious! And your meatballs look like they belong to the incredibly delicious category! I’ve always been curious how meatballs will be when simmered in a sauce for a long time. This sounds and looks so delicious! It seems very easy to make, and I love how short your ingredient list is. Will try it soon. I usually sear my meatballs, then simmer them in sauce, so this was a new method for me as well. But it worked out really well – they turned out perfectly moist and didn’t fall apart at all like I thought they might. Thanks!! Wow this is a nice twist to the Sweet and Sour that I know of usually in Philippines we use Pineapples but your cranberry looks like a really good option. Will try that one out in our next sweet and sour dish. Thanks Raymund! Mm Pineapple sounds great with meatballs as well. I hope you like this if you give it a shot! wow, these look so good and the fact that they are easy delights me. Thanks Maureen! They really could not be easier. I love that you just put them in the sauce and then don’t touch it. Oh dear, thanks so much for sharing such awesome recipes together with the links. Hope you’re having a great week ahead. Thanks Kristy!! It’s my pleasure 🙂 Enjoy your weekend! These meatballs look so amazingly hearty and I don’t think anyone would ever guess what the ‘secret ingredient’ is. I make something vaguely similar with ground meat and kale that has cubed potatoes in it and I think they would suit this one nicely as well! Oh man! Well I can definitely see us expanding in the future. You can never have too many people participating in exchanges like this, in my opinion! And you’re so right that no one would guess the ingredients here – I didn’t tell my friend what was in it before she tasted it, and she had no idea. Your meatballs sound amazing as well! I love the idea of putting kale in them. Yum! Yes! Another use for jellied cranberry sauce! I must admit at first glance the list of ingredients do sound a bit odd, but as I think about them I can see how all the flavors meld quite nicely. If fact this does look as if it might be spectacular – and if you say it is, I know it will be! Fun recipe – thanks. Haha it really is a funny ingredient list but oh, my were these good! And definitely another great use for cranberry sauce! 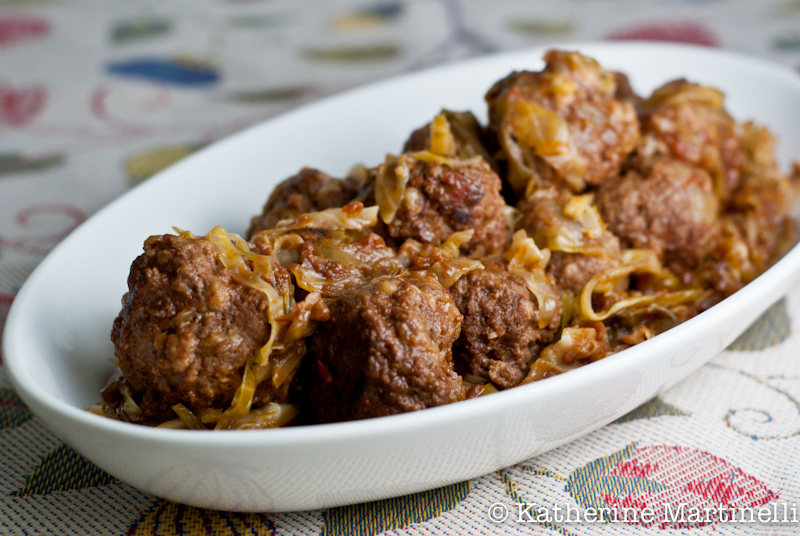 My husband loves ground meat and these meatballs look right up his alley (or belly)! I have never had meatballs like this before! Great recipe Katherine – Oh, and I love your e-book! I just read about this group on Pola’s site and thought that it sounded like an amazing idea! 😀 Thanks for sharing your mother in law’s recipe! Love the idea of world on a plate–brilliant! Well this is timely! I am getting a little tired of chicken dishes and that is always what we use for sweet and sour. Also, this is not the Asian style either, so I am intrigued. I am saving this! Also, glad you landed in the world on a plate group-sounds like a perfect fit for you. Have a great day! On an utterly un-Jewish note (i’m half-), sweet meatballs remind me of my (not Jewish) great aunt’s hamballs. I had always assumed as a kid that these were some particular Italian recipe of hers, although now that I’ve learned more about the 50s, they’re obviously deeply American. Those big, sweet hams themselves are pretty American, and this thing had pineapple in it. I could see Betty Draper-Francis putting it out before anyone in the Old Country. Hahaha that is awesome. I’ve never heard of ham balls but they definitely sound like a wonderful invention of 1950s America. Oh yummy!! These sound so good! It’s almost like you’re braising the meatballs, I can just imagine how flavorful and tender these are! Your photos are gorgeous! This sounds like a really great group! Can’t wait to see what you guys will do next! Thanks Carrie!! I hope you try and love them! Katherine these sound very similar to my mom’s sweet and sour meatballs! World on a Plate sounds awesome – I am looking forward to following and learning more. Awesome! I love family recipes like this. World on a Plate is fun! I just love meatballs. They are such great comfort food. And they’re something my whole family will eat and enjoy. This is definitely a new version for me but I would love to make it – I’m hungry just looking at it! Thanks Suchi!! I hope you enjoy it as much as I do! These sounds delicious! I made Swedish meatballs last week and they were a huge hit. I’m looking forward to making some different ones soon. Thank you Mary! Mmm I’ve always wanted to make Swedish meatballs! That’s next on my list! I believe you when you say these are the best-ever meatballs! I’m going to make them during Passover and I know my family will devour them. This really does sound like a “Jewish mother” recipe – I love it! I made these meatballs last week for Passover (12 people; 3 generations) and they were a huge hit with everyone! They are now going into our regular Passover meal rotation. They were also relatively easy to make, even for that many people. Thank you! I am so happy to hear that! I can’t wait to tell my mother-in-law, she’ll be thrilled. We have them every Passover (and Thanksgiving, and just because).